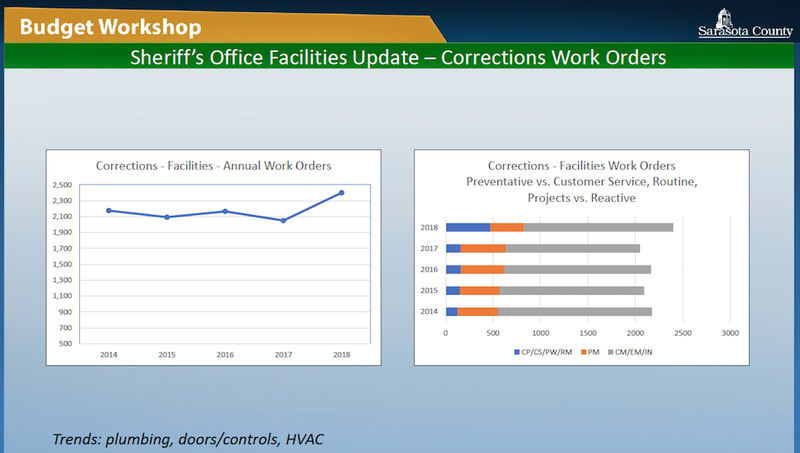 Sarasota County’s Capital Improvement Program (CIP) lacks approximately $4.4 million for projects needed in fiscal years 2020 through 2024 to maintain the Sarasota County Jail in an acceptable condition, the County Commission has learned. 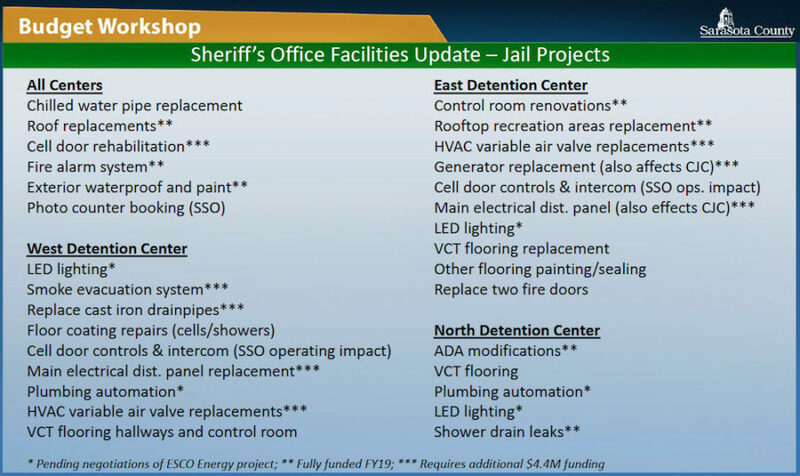 To put that in context, Jeff Lowdermilk, director of the county’s General Services Department, pointed out during the board’s March 29 budget workshop, a new jail has been estimated to cost between $70 million and $120 million. About $2 million of the $4.4 million should be allocated to work in the 2020 fiscal year, he indicated. 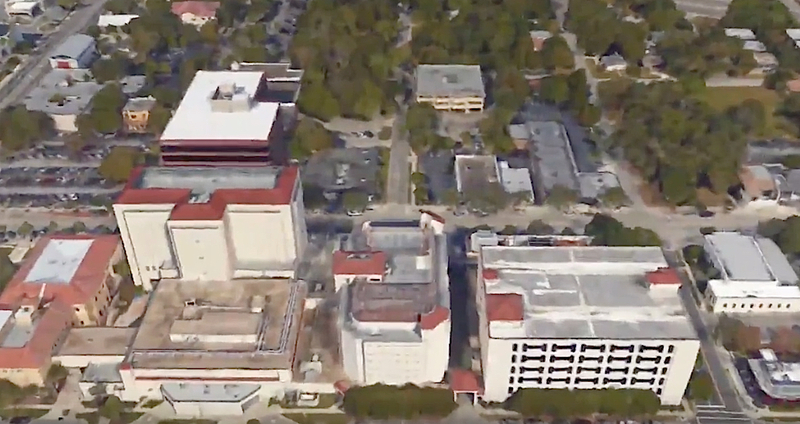 Following recent updates from Sheriff Tom Knight about continuing overcrowding of the jail, Commissioner Michael Moran had requested that county staff research and report on the ongoing upkeep within the three facilities that comprise the detention center in downtown Sarasota. Lowdermilk’s March 29 presentation came in response to that request. In May, the commission is expected to take more time in its annual review of the CIP. During the March budget workshop, commissioners voiced their intent to make water quality initiatives a higher priority, for example. The CIP covers five years, but staff has pointed out that, with passage of the county budget for each fiscal year, only the first year’s projects receive formal approval. The total number of work orders in the 2018 fiscal year was approximately 2,400, he said, out of 18,000 jobs countywide. Lowdermilk responded that staff makes jail projects a priority. Commissioner Nancy Detert asked whether “the users” are the primary reason for the higher number of jail-related work orders. The detention center, she pointed out, “is over-populated, and the type of population that’s there is a destructive one, I’m sure,” compared to patrons of the county’s libraries, for example. “That is correct,” Lowdermilk replied. Lowdermilk then noted a bar graph comparing the totals for three groups of work orders. The largest group entailed reactive or emergency maintenance efforts, he said, as well as issues related to inspections. They are “very costly, too,” he added of those projects, compared to upkeep designed to prevent problems from occurring. Among initiatives that lack funding in the 2020-2024 CIP, he continued, are the following: cell door rehabilitation; a smoke evacuation system in the West Wing; replacement of the main electrical distribution panels in the West and East wings; replacement of cast iron drainpipes in the West Wing; replacement of variable air valves in the heating, ventilation and air conditioning (HVAC) systems in the East and West wings; and replacement of a generator — a project that also affects the Criminal Justice Center on Ringling Boulevard — in the East Wing. 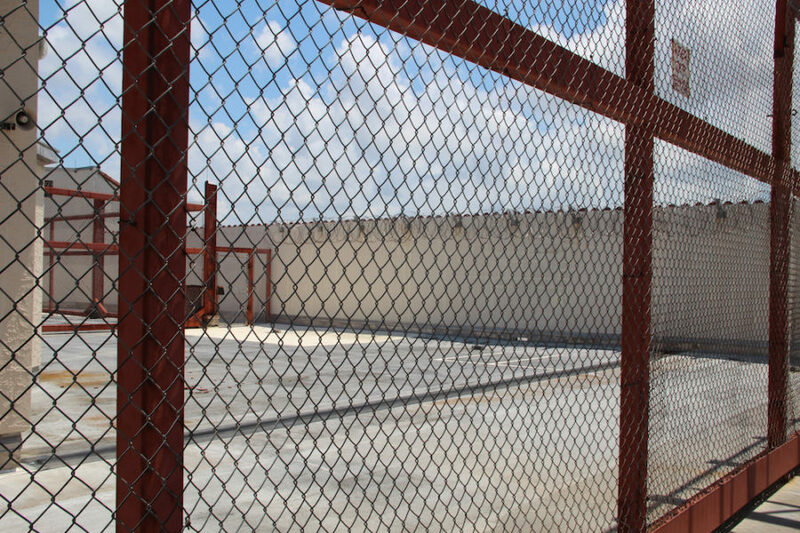 Among the projects for which funding has been provided this fiscal year are the following: replacement of the rooftop recreational areas in the East Detention Center; a new fire alarm system; new roofs; and exterior waterproofing and painting. That year, Lowdermilk continued, the replacement value of the entire complex was estimated at $71,600,624. The overall FCI for the facilities was Good, he said. For both the East and West wings, it was Fair; for the North Wing, Excellent. 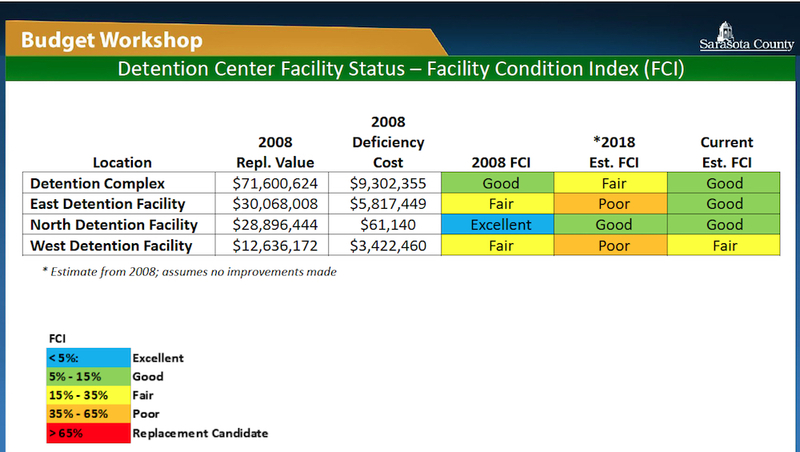 The current FCI estimate for the overall complex is Good, he told the commissioners. Only the West Wing has a Fair rating, a slide showed. If staff is able to pursue the necessary maintenance, he continued, he felt the FCI would remain acceptable. However, he told the board, Sheriff’s Office Corrections Division personnel have other problems with which to contend that ultimately need addressing; those pertain to “operational adequacy.” Among them, Lowdermilk said, are line-of-sight issues. 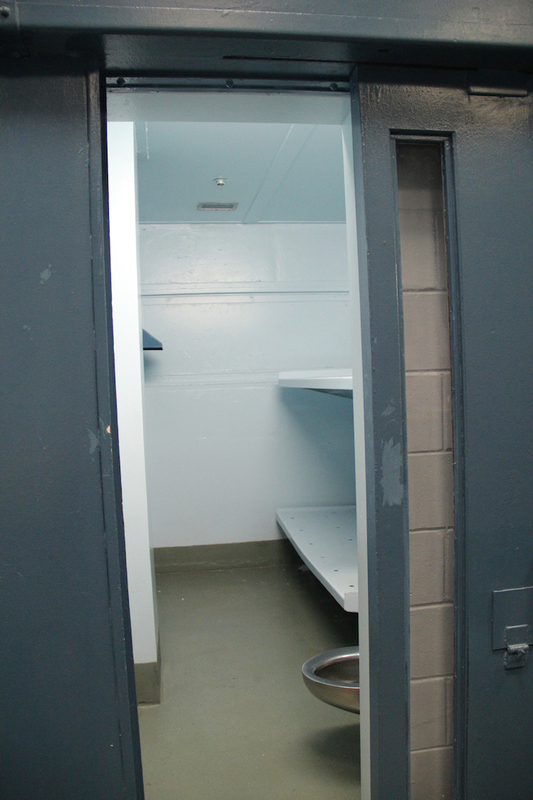 During the June 2016 news media tour, Major Jeff Bell, then the chief of the Courts and Corrections Division, pointed to the same concern as he underscored problems with the oldest building in the Detention Center: “Even if you could refurbish the West Wing,” he said, the Sheriff’s Office has no place to move the inmates.